Physical Examinations – Thorough physical examinations will be performed. Early detection of health problems allows us to manage them more effectively and frequently prevents major problems. We stress the importance of these exams on all puppies & kittens, and thereafter on an annual basis. Since pets age approximately seven times more rapidly than humans, older pets should be examined at least semi-annually. 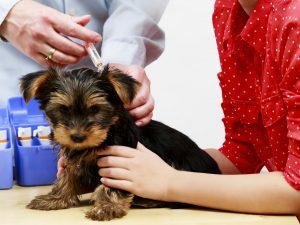 Vaccinations based on Lifestyle – Keeping your pet properly immunized against infectious disease is one of the most important things you can do to insure good health. How veterinary medicine views vaccination protocols and standards have changed whether your pet is a couch potato or a social butterfly we can help you determine the best vaccination choice. Our thorough physical exam ensures that your pet is healthy and you and your veterinarian will decide which vaccines are necessary based on your pet’s lifestyle. Dental Care – Proper dental care can prevent painful gum disease and infected teeth. 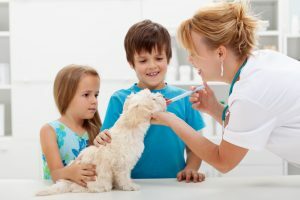 Maintaining a healthy mouth can help prolong many pet’s lives since infections of the gums or teeth can be a source of infection to other major organs. Our staff recommends routine cleaning, polishing, and treatment of diseased teeth as appropriate for good health maintenance. Nutrition – We are concerned about your pet’s wellness and vitality; therefore, we will advise you on proper diet and nutritional needs for your pet. Breed Health Assessment – Mohnacky Animal Hospitals incorporates a breed risk software which helps us educate clients on the medical risks that their breed of dog may be prone to develop in its lifetime. Along with the client’s participation, our doctors are able to make appropriate recommendations at specific life stages for testing that would allow us to work preferably from a preventative standpoint versus a reactive one. Parasite Control – Maintaining your pet on a recommended parasite control program will insure a happier and healthier life. Modern technology has provided us with very safe and effective drugs and medications to prevent heartworms, intestinal worms, fleas, ticks, and other external parasites. We will assist you in choosing the safest and most effective program for your pet. The Center for Disease Control recommends a schedule of multiple dewormings to reduce the chance of infection. It is important to have your pet’s feces examined yearly by a licensed veterinarian to ensure your pet is not harboring parasites. Many parasites do not cause your pet to become symptomatic until long after an infection has taken place. Mohnacky Animal Hospitals are dedicated to providing the highest quality of care for your pet. Mohnacky Animal Hospitals has pioneered and offered vaccinations based on lifestyle with a routine Wellness Evaluation. Our thorough physical exam optimizes your pet’s health with our doctor’s recommendations of specific breed risk testing and appropriate “Core Vaccines” based upon your pet’s health, age, and life style. Mohnacky Animal Hospitals “Core Vaccines” are those that are recommended by the American Veterinary Medical Association (AVMA) and the American Animal Hospital Association (AAHA). The Core Vaccines for Canines are: Distemper, Hepatitis, Parvo, Parainfluenza, Bordetella and Rabies. The use of Non-Core vaccines are only used when the doctor and client determine there may be an added benefit in maintaining your pet’s health. Before we begin a vaccination or health care regimen for your pet, we consult with you to develop a specific plan of action tailored to meet your pet’s needs, based upon your pet’s age and lifestyle. We enjoy having you as an active participant in planning what is best for your pet’s health. Vaccination DHPP #4 (Distemper, Hepatitis, Parainfluenza, Parvovirus) and Rabies. Your pet should be vaccinated for Rabies every three years thereafter. Other vaccination schedules will be discussed at the time of your pet’s annual examination. Depending upon your pet’s health and lifestyle our veterinarian may recommend a DHPP and Rabies booster every three years thereafter. We recommend a follow up examination with appropriate vaccinations in one year. We also recommend spaying or neutering your kitten by six months of age. Roundworms enter the body when ingested as eggs that soon hatch into larvae. These larvae travel through the liver, lungs, and other organs. In most cases, these “wandering worms” cause no symptoms or apparent damage. However, in some cases they produce a condition known as visceral larva migrans. The larvae may cause damage to tissue and sometimes affect the nerves or even lodge in the eye. In some cases, they may cause permanent nerve or eye damage, even blindness. Hookworms larvae typically move about within the skin, causing inflammation in the affected skin. This is called cutaneous (skin) larvae mirgans. One type of hookworm can penetrate into deeper tissues and cause more serious damage to the intestine and other organs. Have puppies and kittens dewormed by your vet at an early age. Start or keep your pet on a preventive drug program that treats and controls these worms. Learn to recognize and avoid possibe contaminated soil, sand, plants, and other objects. Teach children to do the same. Keep play areas, lawns, and gardens around your home free of animal waste. Bag and dispose of pet feces. * “Core Vaccines*” are those vaccines that are recommended by the American Veterinary Medical Association (AVMA) and the American Animal Hospital Association (AAHA).